Happy Mindful Monday! Sometimes mindfulness comes in the form of preparedness, especially when you’ve got kiddos! It seems like my boys are ALWAYS hungry! Can I get a freaking amen??? They seem to go in waves, which I’m assuming are growth spurt related, but they are never on the same timeline. Right now, my little guy is hungry non-stop. I knew we would be on the plane for a solid 5 hours and I wanted them to be satisfied, both for my own sanity and that of our fellow passengers. 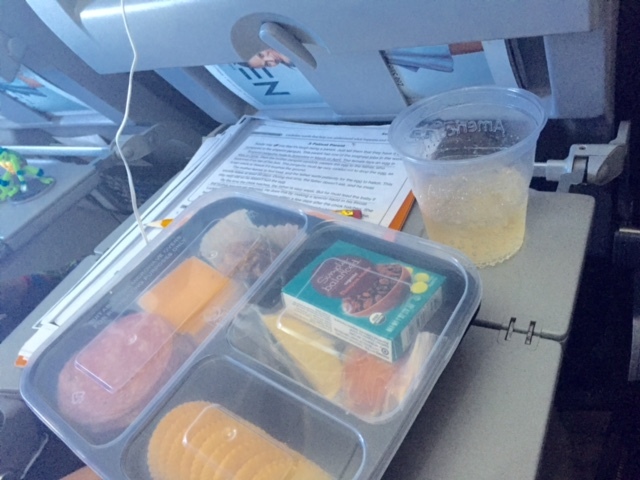 So, I made these wonderful Bento style snack boxes and they kept us all satisfied until touchdown. You’re welcome people of flight #1287 non-stop from Los Angeles to Orlando! My friend and colleague Connie, was gracious enough to throw some samples of these awesome compartmentalized containers my way. You can find this type of thing at Target at varying costs. They come as throw away, ziploc type sturdiness or in a more expensive, long term use, bento style. Whichever you prefer. If you can’t find the kind with compartments, use cupcake papers or snack sized ziplocs to separate your snack items as you’ll see I did here with the cookie. I used salami, cheese, crackers, raisins, apples and my breakfast cookie. The recipe for that can be found here, but feel free to change it up! 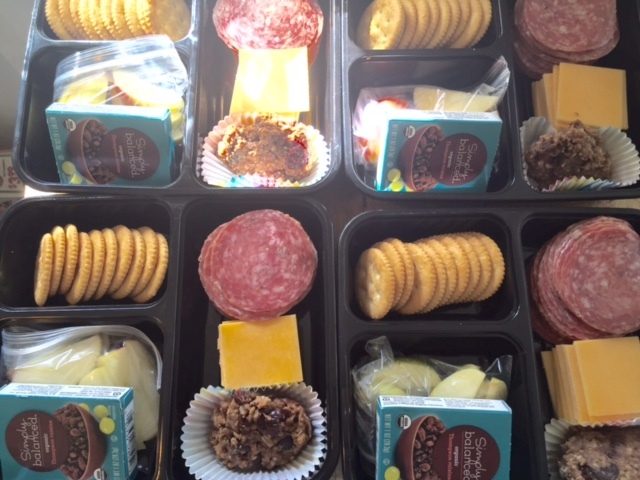 Ham and cheese, cheese only, granola, olives, P,B&Js… all good options! 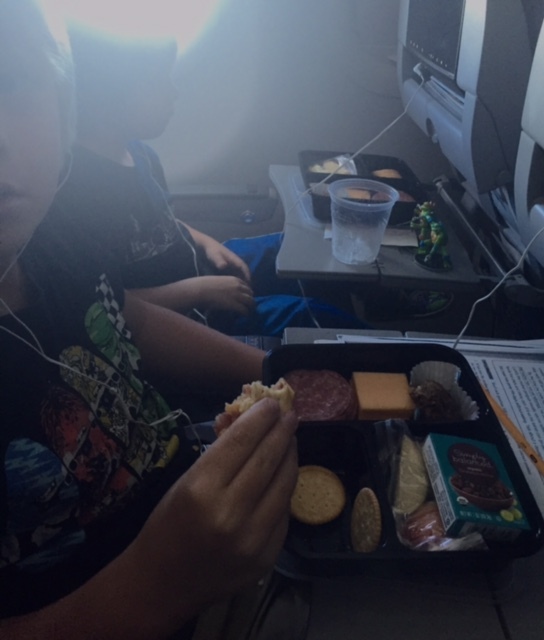 I saved myself the money of purchasing 4 $8 snack boxes and was able to control the items that went into our bellies! A win/win! I apologize for the crappy photos but we were en route! I hope you are having a fabulous Monday! Swearing Mom out. Thank you! It was as delicious as it was handy! These look great! Such a good idea that I’m going to use next flight with my four kids. Question – there’s no problem with bringing these on the plane? Did you have to present them and/or open them during the security check? They did not ask to open them. There is no liquid so, they went through TSA like a breeze. Great question! Very cute idea! Love bento boxes! Wish I would have thought of it when we went back east this summer! Just did a bag of trader joes snacks. It worked well! Let me know if you try it!